Exploring Historic Salem, NJ ~ The History Girl! Salem, New Jersey, somewhat off the beaten path, is a community filled with historic and cultural resources. 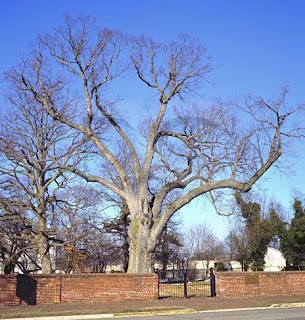 Salem's history can be traced over 335 years, a quite remarkable number for a small, 2.6 square mile city in a predominately agricultural area. However, this unique city, with deep Quaker roots is only a short distance from Philadelphia, has prevailed and remains the seat of county government. Salem was founded by Quaker John Fenwick in 1675. In 1674, Fenwick and Edward Byllynge, a London brewer and leading member of the Society of Friends, purchased Sir John Berkeley's share of land in the western portion of New Jersey. Fenwick, who acted as an agent in the transaction, demanded a percentage of the land to start his own colony. The disagreement over land control ensued and William Penn was called in to moderate the dispute. In 1675, a "Tri-Partite Deed" was signed by Fenwick, Byllynge and three Quaker trustees for Byllynge's creditors. In the arrangement, Fenwick received one-tenth of the original Berkeley grant. He had been granted a territory stretching from Assunpink Creek southward to an area inclusive of the Cohansey River, fronted by the east bank of the Delaware River, most of which occupies much of present-day Salem and Cumberland Counties. In November 1675, Fenwick arrived in New Jersey with 150 settlers. According to local tradition, John Fenwick met with Lenape Indians under a tree in that same year to establish peaceful relations and negotiate a treaty for their lands. In return for the land, it has been reported that the Lenape were given about twenty gallons of rum, eight knives and three pairs of scissors. Today, that famed tree still stands in the Friends Burial Grounds in Salem, estimated to be approximately 500 years old. From the start, Fenwick's Quaker colony was plagued with controversy, and political and financial problems. Although the colony was founded seven years prior to Pennsylvania, it was quickly outpaced by nearby Philadelphia. Eventually, the colony was united with Byllynge's colony of West Jersey, centered in Burlington. Fenwick died in December 1683, with few possessions and no land. He was buried in Salem County, but the exact location of his grave is unknown. In 1695, Salem was incorporated. Salem quickly became a busy and important colonial port engaged in shipbuilding and trade in the late seventeenth and early eighteenth centuries. 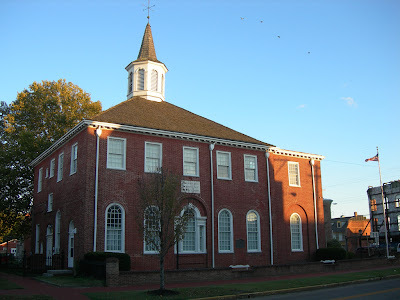 The original Old Salem Courthouse, located at the corner of East Broadway and Market Street, was planned by John Fenwick as a courthouse and jail and constructed in 1692. The present structure was built in 1735 using brick manufactured in Salem County. It was expanded in 1817 and 1908. Today, the Old Salem County Courthouse is the second oldest courthouse in the United States. During the Revolutionary War, the British occupied Salem briefly in 1778 while on foraging expeditions. Their occupation was known as the Salem Raid. However, the British were met with opposition in the villages surrounding Salem as they looked for supplies and engaged in skirmishes with the local militias. One attack that stands out is the Hancock House massacre, in which the Queen's rangers carried out a surprise raid on the local militia housed at Hancock's Bridge. The British troops were given orders to "spare no one." Not a single shot was fired during the raid. All those involved were bayoneted. After the war, treason trials were held at the Salem courthouse where suspected Loyalists were put on trial for having allegedly aided the British raid. Four men were convicted and sentenced to death for treason; however, they were pardoned by Governor William Livingston and exiled from New Jersey. In the nineteenth century, industries such as glassmaking, canning, milling, floor coverings, and shipping were based in the city. These industries thrived for a number of years through World War I. As industrialization declined, so too did Salem. Today, some industry remains, mostly along the waterfront, but Salem county's pursuits remain agricultural. Within the past twenty years, a revival of the downtown and preservation of key contributing buildings to the city's historic district has taken place, demonstrating Salem's willingness to adapt and embrace its historical past to promote heritage tourism. The Salem County Historical Society occupies three inter-connected buildings on Market Street. The centerpiece of these buildings is the Alexander Grant House, built in 1721. The home and its flanking wings are constructed of brick, typical of Quaker construction in this region of New Jersey. Alexander Grant moved to Salem County from Somersetshire, England in 1700. He quickly became a prominent member of the community. In 1716, he became a justice of the courts for one of the special trials held in Salem in April, 1717. This special court was held to try an African American who had murdered a man named James Sherron. A deed dated March 17, 1721, describes the location of Grant's home on the west side of Bridge Street, which is the present-day historical society building. At the rear of the house is the keeping room, believed to be the original room of the house built circa 1717. The room includes a large walk-in hearth and sleeping loft above. The home served as a private residence for over two centuries. After being owned by the Grant family, the house was passed to the Gibbon family, the Johnsons, and finally, the Hubbells. The last generation of Hubbells turned the house over to the Salem Country Historical Society in 1929. 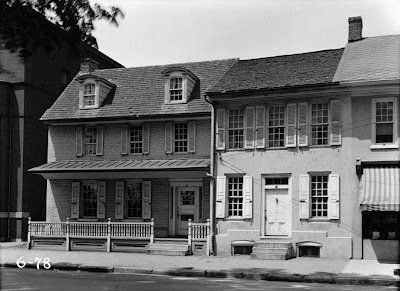 For a short time, the building was used as an inn for a time under the name "The Temperance House."
The Hubbell sisters, Anna and Helena, descendants of Alexander Grant, donated the house to the Salem County Historical Society. The building was expanded in 1957 with the acquisition of the Rumsey Wing, which was constructed circa 1800. On the grounds of the Society is the John Jones Law Office. This one-room, octagonal, brick structure laid in Flemish bond, with a conical roof of eight facets covered with wood shingles, was built in 1735. John Jones used this little office for about a decade. On March 3, 1746, the Pennsylvania Gazette printed a notice to “All persons indebted to the estate of John Jones, late of the town of Salem, attorney-at-law." The office was originally located near Broadway and Market Street. After Jones' death, it was used as a medical office by Dr. Ebenezer Howell. It is believed to be the oldest surviving law office in the United States.The law office was moved from its original location in 1938 to the Salem Courthouse grounds and it was moved to its present site at the Society in 1967. John Jones Law Office, built 1735. The Salem County Historical Society grounds also include a reconstructed log cabin, built circa 1800, and a stone barn built in 1959. The log cabin serves as an education center for school groups and the stone barn houses additional collections of the Society. The Society's collections and research library hold vast amounts of historical documents, rare books and manuscripts. Among their collection are two items of particular importance. The Society is in the possession of a Windsor bowback chair that once belonged to William Penn and a ring which contains a lock of George Washington's hair. Windsor bowback chair once belonging to William Penn. Salem's Broadway and Market Street are listed on the New Jersey State and National Registers as historic districts. The simple red-brick buildings that line these streets are reminiscent of the row homes found along the streets of Philadelphia. Salem is a community rich in history and its appreciation for its history is demonstrated by its commitment to preservation at the local and county level, fueling the heritage tourism industry of New Jersey. It was wonderful to read your article on Salem. Those of us who grew up in Salem appreciate the beauty in the architecture, history, agriculture and the wonderful people who live there. Thank you!